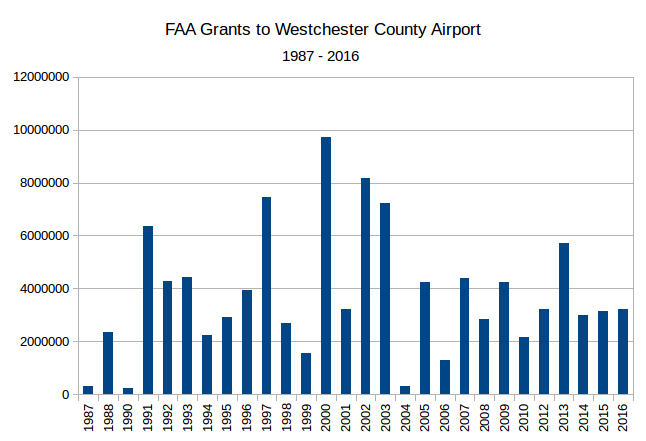 Westchester County’s airport master plan is a poorly researched, plagiarized travesty that is a waste of $1.4 million of taxpayer money. The plan acknowledges but ignores the Terminal Use Regulation governing the volume of airline flights at the airport. 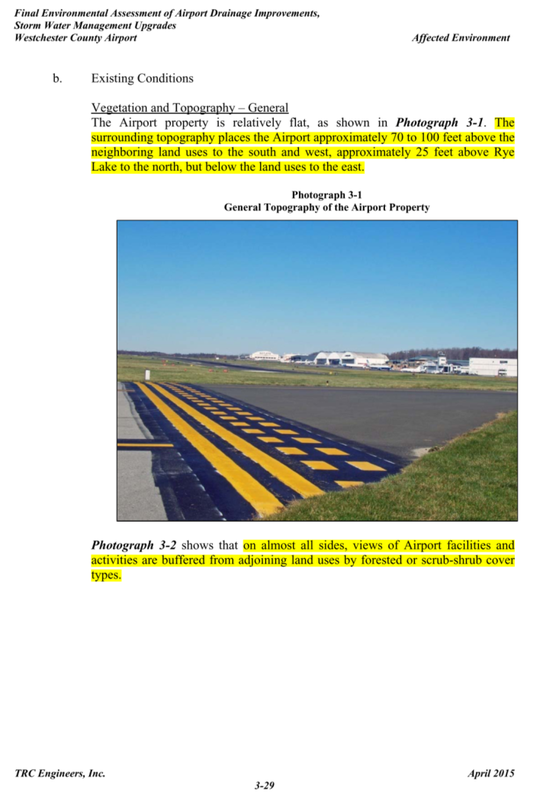 It goes on to assume there are no constraints to airport development, despite the Terminal Use Regulation, the adjacent residential neighborhoods, and the presence of the Kensico Reservoir and NYC DEP’s jurisidiction over tributaries of the Kensico. Calls for $153 million in public funds to build and renovate facilities for corporate jets, including 3 new hangars. $115 million of this would come directly from County taxpayers. David McKay Wilson of The Journal News wrote an excellent article critiquing the master plan’s calls for expansion. 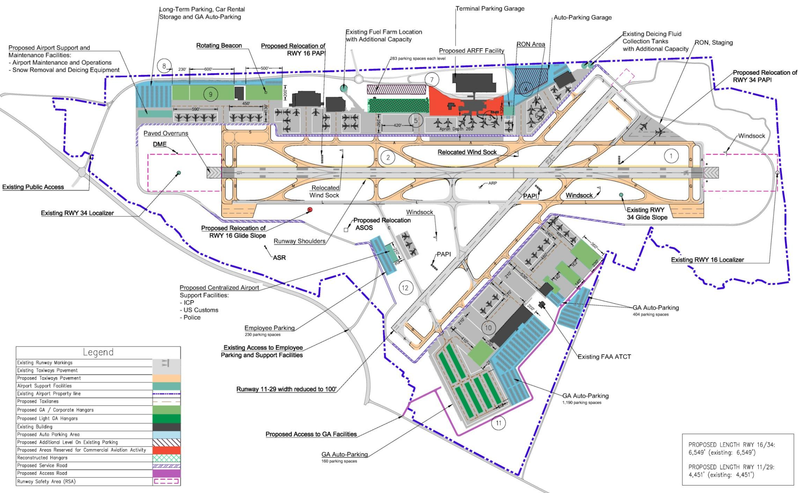 The airport’s last master plan was adopted in 1987. Substantially all of the construction called for by that plan in fact took place. Even though that plan is now 30 years old, the county has continued to receive federal grants for airport improvements at a steady pace. While the proposed master plan is solely an expansion plan, federal grants have often been awarded for other purposes, like minimizing the airport’s environmental impacts. $1.2 million was awarded for noise monitoring, and $3.1 million was awarded from 2012-2016 to minimize the impact of airport stormwater on the Kensico Reservoir and Blind Brook. The proposed master plan was begun in 2012. The original contract with DY Consulting, the primary contractor, specified that the plan was due December 31, 2016. For years, the county refused to release any information regarding the plan to reporters or to the public. The County Airport Advisory Board acknowledged that the plan was substantially complete and delivered to the FAA at its meeting on April 26, 2017. Still, the county refused to release the plan to the public or even to the county legislature. It was only after disclosures that the draft plan was released to companies bidding to privatize the airport that the county finally released the document to the public on May 19, 2017. The purpose of the plan is to provide a guide for construction at the airport in accordance with predictions of future traffic and with county policy. It is therefore important that the plan begin with a complete analysis of the circumstances at the airport and the best data available to drive the forecast. Otherwise, the plan’s conclusions will be based on inaccurate predictions of the future. Even though the plan was not completed until 2017, the plan does not use any actual data after 2013 in its forecasts or conclusions. The plan’s descriptions of current infrastructure at the airport ignores improvements made after 2015. The plan ignores longstanding county policy against expansion of the airport, including Resolution 245-2003, which expressly opposed any increase in the total capacity of the airport’s runways, taxiways, ramps, gates, hangars, terminal, parking areas, or access roads. The plan states that there are no “decisions by the airport sponsor to not accommodate future growth” (Page 3-22). The plan omits existing environmental laws that restrict development because of the airport’s location next to the Kensico Reservoir. Multiple jurisdictions, including the New York State Department of Environmental Conservation and the New York City Department of Environmental Protection, have authority over overlapping parts of the airport. Despite all of these circumstances, the plan claims that “there exists no constraint to the Airport accommodating passengers” and proceeds to base its conclusions on “an unconstrained growth scenario” (Page 3-23). The FAA mandates that airport master plans take the environment into account. 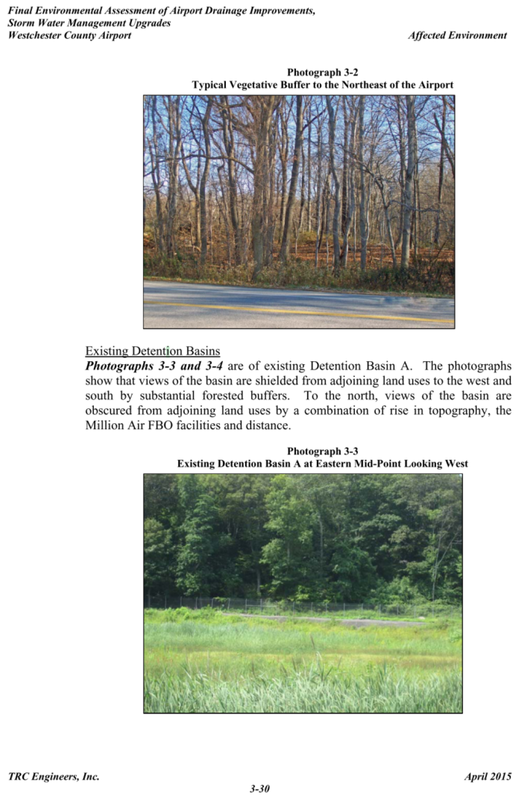 The FAA document governing master plans specifically states that environmental factors should be considered, and that potential key environmental impacts of each development project in the master plan should be identified. The master plan’s consideration of environmental concerns are wholly inadequate. In the case of greenhouse gases, the master plan asserts, with no evidence or explanation, that “the proposed project would not increase [greenhouse gas] emissions compared to the future no action alternative” (Chapter 5, Page B-3). It is obvious that there would be some impact on emissions, given that the plan calls for $462 million in construction to expand the airport. The incompetence extends to the plan’s treatment of surface water, perhaps the most critical environmental issue facing the airport given its location next to the Kensico Reservoir. Again, with no evidence or analysis, the plan asserts that the extensive construction described “is not likely to exceed water quality standards established by Federal, state, and local regulatory agencies or contaminate public drinking water supply such that public health may be adversely affected” (Chapter 5, Page B-10). 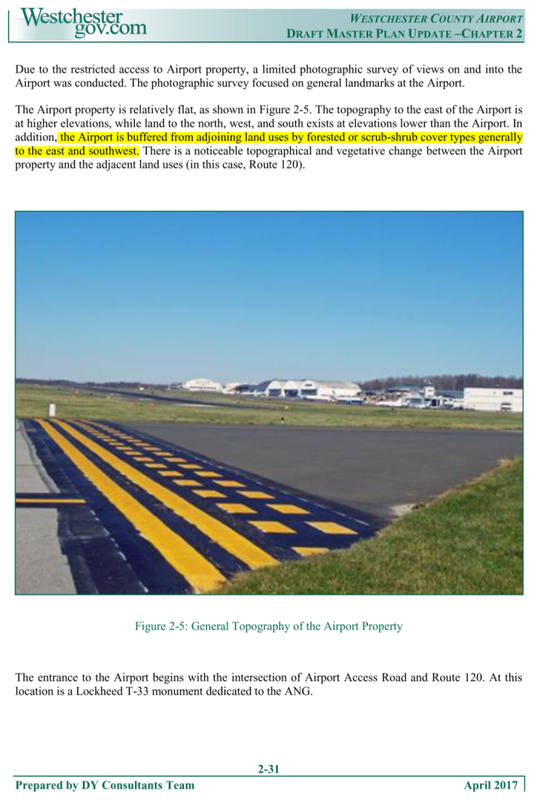 This naked assertion is made despite the plan calling for the construction of three new corporate jet hangars, parking lots for aircraft & cars, and maintenance facilities in an area of the airport where storm water drains into the Kensico. Chapter 2 is ostensibly a review of the airport’s setting and its existing environmental protections. In reality, it is clear evidence that environmental protection was an afterthought in the creation of the master plan. Large portions of this chapter are plagiarized from sources around the Internet, including CNN.com and the county’s website. 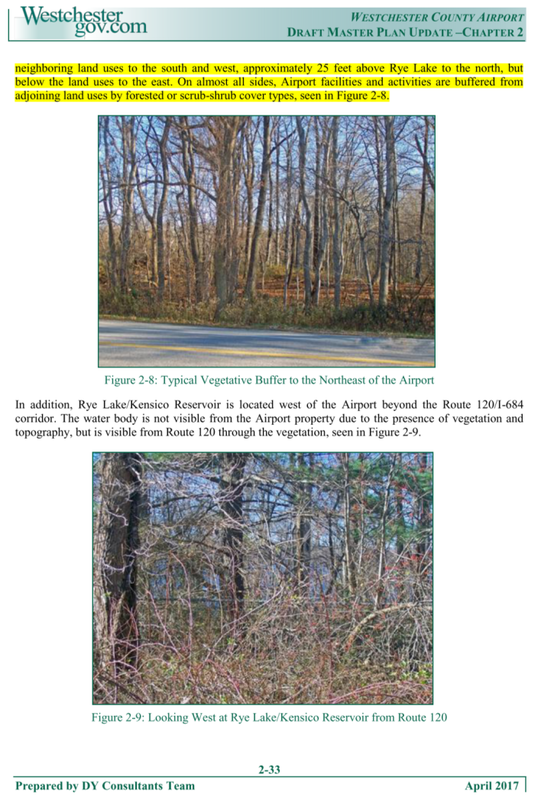 Other portions of Chapter 2, like this section describing the airport’s storm water management plan, are directly copied from existing reports on the county web site. In these cases the source is attributed, so while these are not examples of blatant plagiarism, they are evidence of shoddy work and a failure to conduct the paid-for analysis. In the five years between when the master plan was begun in 2012 and when it was deemed complete and submitted to the FAA in 2017, only one public meeting was held, on July 17, 2013. This meeting is detailed in Chapter 9 of the master plan. Less than 10% of the attendees were airport neighbors or community members; the vast majority were pilots and representatives of businesses at the airport. To this day, public meetings hosted by the airport are poorly advertised. Hundreds of community members attend town meetings about the airport, yet required public feedback sessions held by the airport are only able to attract a few dozen people, and even fewer people from the general public. The disparity suggests a conscious effort to minimize public input into the airport. In order to do the bare minimum to satisfy requirements for public input, DY Consulting and the Astorino administration held a public hearing on their master plan on July 28, 2017. At that meeting, all but one speaker expressed major concerns and disapproval of the master plan. Astorino spokesman TJ McCormack even admitted that “the public had no input in the development of the master plan” until this public hearing. Despite the opposition, it does not appear that any of the public comments were incorporated into the master plan, even though some of the criticism came from elected officials. Dennis Yap, the president of DY Consulting, repeatedly misled the public at the public hearing. He claimed the plan recommended no change to the airport’s curfew, despite the draft plan making no such recommendation. He claimed the plan recommended no change to the TUR, despite the plan explicitly ignoring the TUR. He claimed that the plan recommended no new gates be added to the terminal, despite the plan describing 2 new jetbridges as being necessary for its predicted increase in airline traffic. The master plan’s suggestions for development are inconsistent with the rest of the report. Plans for expansion of airline infrastructure are explained by the traffic forecasts, as flawed as they may be. However, the plan also calls for $153 million in public funds to build and renovate facilities for corporate jets. This runs counter to the plan’s predictions that no new corporate jets will be based at the airport and that the total number of private flights will decrease by 5% over the planning period. Relocating the US Customs facility for private flights into a new building 2000 feet away from its present location at a cost of $10 million. The plan justifies the move by alternately claiming that the existing location causes airplanes to cross the airport, or that the current location is somehow unfair. But the new location would still require airplanes to cross the airport. A more likely explanation is that NetJets, which happens to have its facility far away from Customs’ current location, lobbied for the change. The removal of facilities for light general aviation that makes up over 50% of the aircraft based at the airport today. The plan assumes that these aircraft will be parked in new hangars, despite rents for hangars being 3 times the price. Using public funds to build new hangars for corporate jets, despite these hangars already being constructed today by private businesses catering to these jets. $30.4 million in construction to narrow runway 11-29 for no reason other than the current width being wider than required by the FAA. The master plan’s list of suggested construction projects doesn’t make sense unless the real plan is to increase profits at the airport in conjunction with privatization. While the plan’s traffic forecast is fatally flawed, an honest plan based on this forecast would suggest reducing or making no changes to facilities for a shrinking number of private flights. But the plan does no such thing; instead, it recommends $153 million in spending to expand facilities for more profitable corporate jets, while eliminating facilities for small airplanes that are affordable for ordinary residents and provide training for aspiring pilots in our community. The timing of the plan’s release further supports this narrative. The contents of the plan suggest that it was actually completed in 2014 or 2015: no data after 2013 is used in preparing its forecasts, and descriptions of the airport do not include upgrades made in 2014 and 2015. Indeed, in their 2012 bid, the consultants expected that the plan would be completed within 14 months. Why, then, was the plan hidden from the public and not submitted to the FAA until after the first round of talks to privatize the airport in 2016? Why was the consultant allowed to miss the December 31, 2016 deadline without penalty? There is a false dichotomy between the airport master plan and privatization. It is obvious that the bidders are hoping to profit from the airport master plan, and will pressure the county to implement it.